The Lebanese cuisine is filled with so many amazing vegan options and this is one of them. I will be in Lebanon next week which is SO exciting, I will make sure to update my instagram (rana.banana) with all the yummy vegan finds! 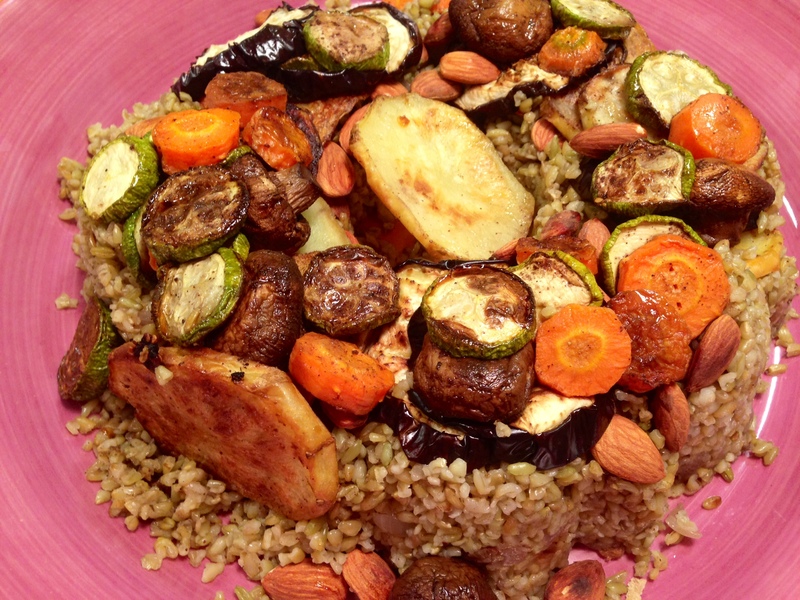 Freekeh! The name alone gets a lot of attention, freaky, get it? Ok ill stop now. On a more positive note I have been enjoying my vegan month so much that I think it just MIGHT change the way I eat for a long time! The benefits I feel are endless, but most of all I love the feeling that I am doing something good for my body and the planet. Let me share one of my favorite things to do – Add ingredients to a pot, 30 minutes later I have a ready healthy and delicious meal. Simple, easy and quick! Even though I love to cook, I sometimes just want a quick healthy dish in under 30 minutes! Pizza could be one of the most diverse dishes out there, not only can you choose your toppings depending on your diet preferences but even the crust! I enjoy these on the weekend when I have a little bit more time to cook. My husband is a meat lover so he usually likes to fill these with chicken!